--THE WEDDING OF THE CENTURY? 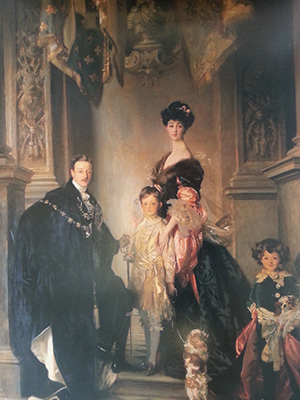 In 1895, Consuelo wed the 9th Duke of Marlborough, whom she did not love and hardly knew. Her New York City wedding boasted a 60-piece orchestra, a 54-voiced choir and 4000 guests. No matter that she was in love with someone else and her new husband disliked America and Americans. Check out info on this extravaganza by Googling Wedding of the Century on the Smithsonian Channel website under Million Dollar American Princesses. --HOME SWEET HOME? 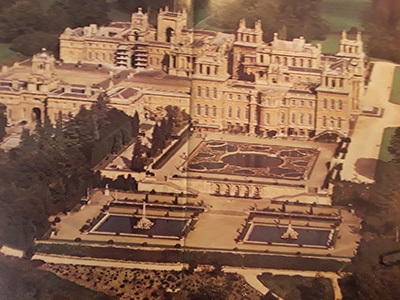 Although Consuelo was used to grand houses, her new home was the “little” love nest of 187 rooms under acres of roof called Blenheim Palace in England. She was appalled Blenheim was still run like a feudal estate and started out to change things. --FAMILY DUTY? Consuelo bore the duke his ‘heir and a spare’ to carry on the Marlborough title, but her own marriage was not a success. Yet Consuelo found the love or her life, rebelled against her circumstances and did much for poor people as well as championed the vote for women. this will have to do. Check out the royal weddings in my historical novels. Even the characters in Downton Abbey knew THE IT GIRLS! 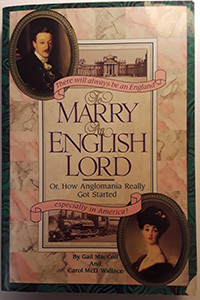 Tom Branson mentioned that Mrs. Glyn "writes scandalous books." When Edith was first to be married but then was left at the altar, her family members planning her trousseau mentioned putting her in Lucile lingerie. 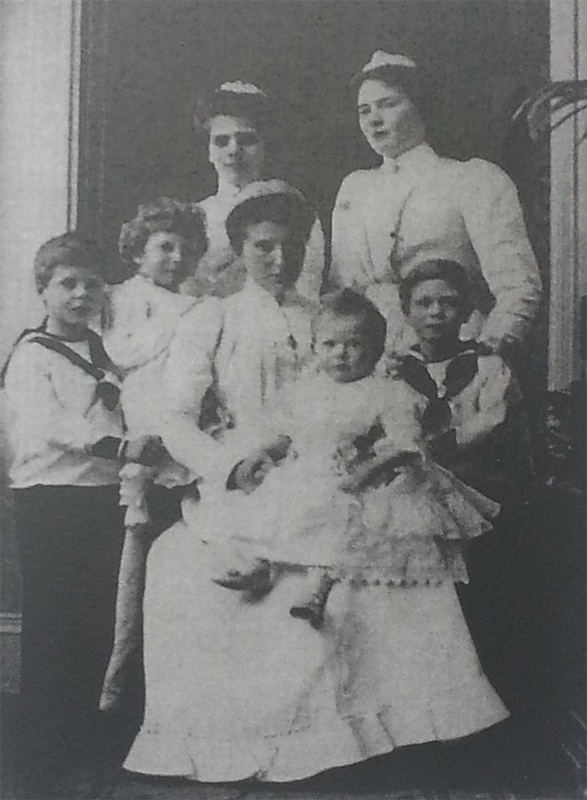 Lucile, Lady Duff Gordon, 1862 - 1934, survived the sinking of the Titanic and so much more. She designed clothes for the rich and famous; got women out of corsets; used fashion show with live "mannequins"/models instead of stuffed linen dummies. Her lingerie designs were scandalous. Elinor Glyn, 1864 - 1943, wrote 18 romances to support her family. Her scandalous novel Three Weeks was banned in Britain but a hit in the US. She wrote 16 movies scripts for the silents in Hollywood where she promoted Rudolph Valentino and dubbed Claire Bow the "it" girl. What sisters! What a story! 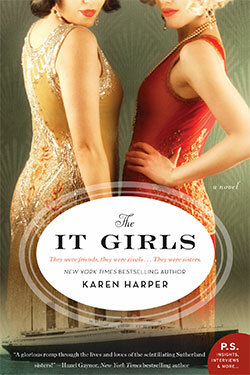 THE IT GIRLS on Book Club Girl. Listen to her read a selection from the book here! Booklist: Film-history buffs will adore exploring the early days of Hollywood with cameos from famous stars; fans of Kathleen Tessaro and Penny Vincenzi will enjoy the layers of intrigue and the sweeping plot. Harper's ability to shift between raw ambition and tender compromise makes this family-focused novel a genuine delight. 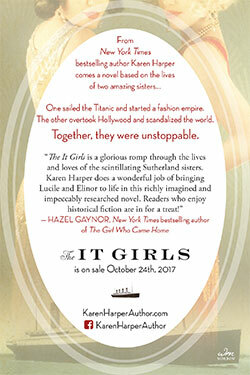 RT Book Reviews: [Four-stars] Not only is this a fabulous portrait of the time, but it is also a deftly crafted portrait of the complexity of sisterhood...Kudos to Harper for breathing life into [the sisters'] remarkable stories. 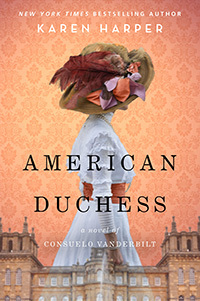 Historical Novel Reviews: This biographical novel outlines the remarkable lives of Lady Lucy Duff-Gordon, whose imaginative fashion designs led the way to a daring, corset-less style of dressing for women in the early years of the 20th century, and her younger sibling Elinor Glyn, whose romance novels shocked and entranced readers with their bold sensuality. Jathan & Heather website: Yet despite all the glitz and glamour chronicled here, at its heart, The It Girls is a novel of sisterhood...This is a book that is sure to inspire a whole new generation of women to break barriers, follow their hearts, and live boldly. Based on a seldom-told true story, The Royal Nanny is perfect for everyone who is fascinated by Britain's royal family--a behind-the-scenes look into the nurseries of little princes and the foibles of big princes. If you love Downton Abbey, this is your book. From Britain's old wealth to the glittering excesses of Tsarist Russia; from country cottages to royal yachts, and from nursery to ballroom, Charlotte Bill witnesses history. 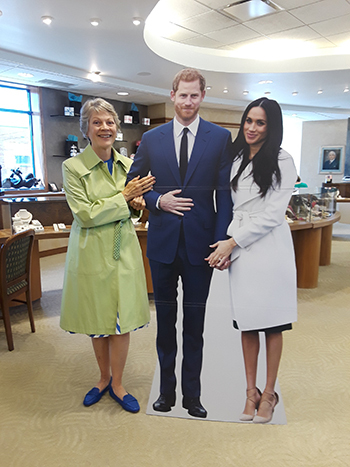 The Royal Nanny is a seamless blend of fact and fiction--an intensely intimate, yet epic tale spanning decades, continents, and divides that only love can cross. So begins the story of Charlotte Bill, who would care for a generation of royals as their parents never could. Neither Charlotte--Lala, as her charges dub her--nor anyone else can predict that eldest sons David and Bertie will each one day be king. Lala knows only that these children, and the four who swiftly follow, need her steadfast loyalty and unconditional affection. But the greatest impact on Charlotte's life is made by a mere bud on the family tree: a misunderstood soul who will one day be known as the Lost Prince. Young Prince John needs all of Lala's love, the kind of love his parents won't--or can't--show him. Step into the world of Edwardian England and the heart of a strong British commoner, a Cockney woman with spirit and soul, Charlotte (Lala) Bill. later King George V and Queen Mary, grandparents of the present queen. Assistant nursemaids in back of photo. 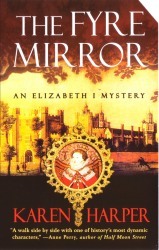 THE QUEEN ELIZABETH I MYSTERY SERIES IS NOW AVAILABLE IN AUDIO! See below for information on how to order. London, 1501. 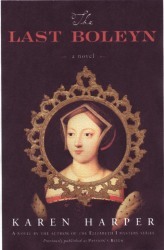 In a time of political unrest, Varina Westcott, a young widow and candlemaker for court and church agrees to perform a clandestine service for Queen Elizabeth of York, wife of Henry VII. She will carve wax figures of four dead children: two of Elizabeth’s offspring lost in infancy and her two brothers, the Princes in the Tower, whose mysterious disappearance years ago has never been solved. Having lost a child herself, Varina feels a sympathetic bond with the queen. As she works under the watchful eye of handsome Nicholas Sutton, an ambitious assistant to the royals, she develops feelings of quite a different nature. Then from Wales comes news of the unexpected death of newly married Prince Arthur, the queen’s eldest child and heir to the throne. Deeply grieved, Elizabeth suspects that Arthur did not die of a sudden illness, but was cleverly murdered by her husband’s enemies. 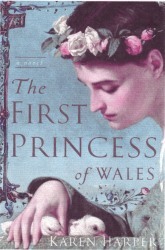 This time her task for Varina and Nicholas is of vital importance—travel to wild Wales to investigate the prince’s death. But as the couple unearths one unsettling clue after another, they begin to fear that the conspiracy they’re confronting is more far-reaching than even the queen imagined. And it aims to utterly destroy the new Tudor dynasty. 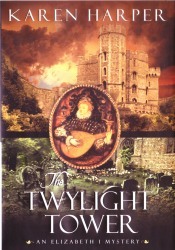 I had great fun writing MISTRESS OF MOURNING, not only because I love England and the Medieval and Tudor eras (which this novel bridges,) but because the two historical mysteries within have never been solved: the disappearance of the two young princes in the Tower of London and the strange, sudden death of Arthur, Prince of Wales, older brother to King Henry VIII. Had Arthur not died, Henry would never have been king. 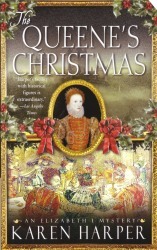 Research for this novel also gave me a close up look at Henry VIII’s parents and boyhood. To understand any man, look at his childhood. No wonder Henry was paranoid that someone would take his power! No wonder he was a master manipulator and felt he was always right. His other later traits are also well-grounded in his past. I also loved the opportunity to get close to a ‘middle-class’ woman of that time. Varina is only allowed to run her shop because her husband left it to her in his will. If she weds again, all she owns goes into the hands of her new husband. It was not a time of equality of the sexes, but Varina handles the men’s world of her day as best she can. MISTRESS OF MOURNING will also be released in the United Kingdom from my British publisher, Random House UK, under the title THE QUEEN’S CONFIDANTE. To see that very different cover, take a look at it on the British Books page. 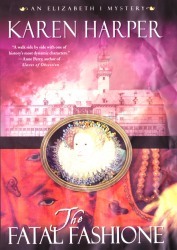 “The grief of a sister and mother who also happens to be queen of England combines with the fire and spirit of a lovely waxworker in Karen Harper’s riveting tale of just what might have happened to the princes in the tower and the first Tudor crown prince.” –Karleen Koen, New York Times bestselling author of Through a Glass Darkly and Before Versailles. 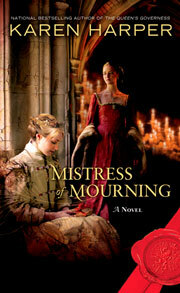 “Beloved author Karen Harper brings Elizabeth of York to vivid life in Mistress of Mourning. 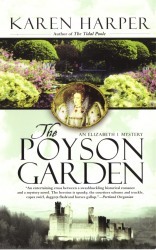 Through the eyes of charming and adventurous wax chandler, Varina Westcott, the tumultuous era of the new-born Tudor dynasty is depicted as it surely was—a time rife with danger, passion and murder. The exciting story and its appealing heroine kept me reading late into the night with sheer enjoyment.” --Sandra Worth, author of Pale Rose of England and The Queen’s Daughter. 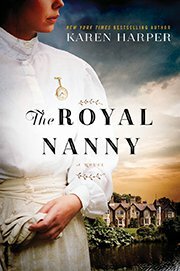 “Much like her endearing chandler heroine, Varina, Karen Harper warmly illuminates a little-explored craft and two persistent royal mysteries, skillfully melding the hearts and lives of the high and low born. Mistress of Mourning delivers adventure, romance, and surprise; a fresh cache of treasure for devoted Tudorphiles, the book is also certain to enchant readers new to the era’s charms.” –Sandra Byrd, author of To Die For: A Novel of Anne Boleyn. 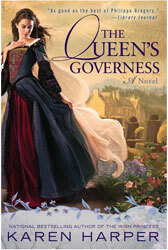 READER’S GUIDE AND BOOK CLUB DISCUSSION QUESTIONS ARE INCLUDED IN THE QUEEN’S GOVERNESS. 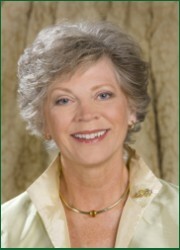 Reputed to be Elizabeth Fitzgerald Clinton, Countess of Lincoln. 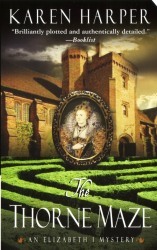 Torn from Ireland and her defeated family, Elizabeth (Gera) Fitzgerald, “the uncrowned princess of Ireland,” dares to defy the powerful Tudors in her quest for revenge. But Gera finds love with a bold Tudor sea captain and discovers that Mary and Elizabeth Tudor are sometimes at odds with their royal father, Henry VIII, too. From Ireland’s lush fields to the glittering royal court of England, this is the story of a daring woman whose will cannot be tamed. "Harper (Mistress Shakespeare) is in fine form, using strong-willed Irish noblewoman Elizabeth Fitzgerald, known to history as the Fair Geraldine, to explore the court of the aging Henry VIII and the brutal political struggles of the time. Raised in a family at the center of the struggle for Irish home rule, young Gera flees to England as most of her relatives are imprisoned or executed. 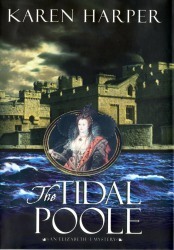 Entering court politics first as a lady-in-waiting to Henry's doomed fifth queen and later wife to highly placed courtier Sir Anthony Browne, her desire for revenge and the reinstatement of her family is balanced by respect for the disinherited princesses Mary and Elizabeth, care for her husband's position, and her secret attraction to seagoing nobleman Edward Clinton. Tudor fans will enjoy this skillfully fleshed-out tale of an adventurous young woman coming-of-age inside a court constantly on edge. (Feb.)"
It was partly a trip to Ireland and partly my stumbling on an intriguing woman while I was researching another book that pointed my way to my latest Tudor-era historical novel, THE IRISH PRINCESS. My husband and I had a wonderful trip to Ireland several years ago. Although I am an Anglophile at heart and am a product of English and Scottish heritage (I even did Scottish Highland Dancing for years), I fell in love with Ireland and the Irish. 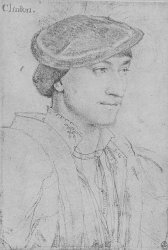 The Earl of Lincoln (then known as Lord Clinton) by Hans Holbein the Younger, c. 1534–1535. Of course we did all the usual stops: kissed the Blarney stone—all authors are, of necessity, full of blarney. We visited Cardiff Castle, did the Ring of Kerry, and toured old Dublin town where I walked into a bookstore that actually carried my books. 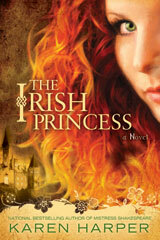 But at that time, although I looked for an Irish heroine as a hook for a book, I didn’t find one. 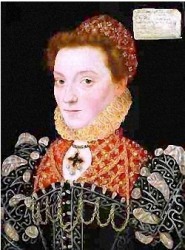 But later when I was researching Queen Elizabeth I’s ladies-in-waiting for THE QUEEN’S GOVERNESS, I stumbled on the fact she had a long-time Irish friend, a celebrated beauty, at that. The poet Henry Howard, Earl of Surrey, had written a poem extolling ‘the Fair Geraldine,’ a woman named Elizabeth (nickname Gera) Fitzgerald, whose family had been called “the uncrowned kings of Ireland” and had been brutally ruined by King Henry VIII. What gives, I thought. 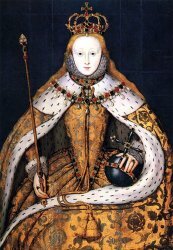 Elizabeth Tudor mistrusted the Irish. Beautiful women around her (and another redhead!) always made her nervous. Was this another example of the unspoken Tudor practice that, if a powerful family threatens your throne, kill off the men and keep the women close so you can keep an eye on them? Another portrait of Elizabeth Fitzgerald Clinton, Countess of Lincoln. But then I found what I call “a telling detail” about the these two Elizabeths. The queen once sent Gera Fitzgerald to the Tower for ‘plainspeaking to the queen.’ Yet Gera was released almost immediately and was back in the queen’s good graces. Stranger yet, at least once, Gera commanded a ship which captured pirates who were taking French ships and giving the queen a bad name. Aha, I had to write a book about this Irish woman, the “uncrowned princess of Ireland.” What a dynamic woman she must have been. And to top it off, I found she had a bittersweet romance (yes, with a happy ending, a sine qua non for me) with a dashing, swashbuckling English hero, Edward Clinton, the Lord High Admiral of the English Navy. Look out Johnny Depp! But research wasn’t easy. I had to “find” Gera in books about other people. 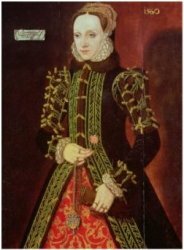 With the exception of her once hated rival and later longtime friend Elizabeth Tudor, I discovered Gera’s story through reading about the men whose lives she touched: her husband, her father and her brother whose rebellion brought the wrath of the Tudors down on her family and Ireland. Of course, I’m writing faction, basing the book on fact but fictionalizing what I cannot find. But I believe I stayed true to the real woman, and I was pleased to see that Gera’s defiant face on the cover of THE IRISH PRINCESS is very close to her extant portraits. Happy historical reading! I am a life-long, avid anglophile and fan of all things Tudor. (Yes, I even watch The Tudors on Showtime, though I would take me hours to list all the historical inaccuracies in the series.) But in my reading, I always noticed a fascinating personality who seemed to stay in the background but who was, in a way, the power behind Elizabeth’s throne—Katherine “Kat” Champernowne Ashley, the queen’s governess. And, since Elizabeth lost her mother at age three and did not remember her, Kat was what we would call today the queen’s foster mother. 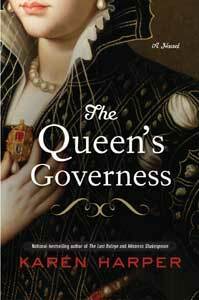 THE QUEEN’S GOVERNESS is a Kat’s-eye-view of one of the most turbulent and tragic families in history, the amazing, terrible Tudors. But Kat has her own tale of betrayal, love and loss to tell. Reviews and other information will be posted here as pub date approaches. Like all my books, this novel is also available in e-book format. "Katherine Ashley is the daughter of a country squire with no hope of a future, until a chance meeting with Thomas Cromwell gets her sent to Henry VIII's court as a waiting gentlewoman to Queen Anne Boleyn and a spy for Cromwell. When Boleyn comes to an untimely end, Ashley becomes tutor and servant to her daughter, Elizabeth, and accompanies the girl throughout her trials and tribulations before she finally takes her father's throne and goes on to become England's greatest queen. 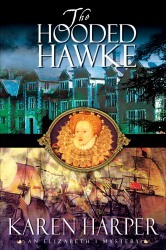 Rarely does a work of historical fiction endeavor to cover so much territory—Ashley lives through the reigns of four Tudors—but Harper's diligent research, realistic portrayal, and insider/outsider heroine will hook those who can't get enough of England's turbulent history. 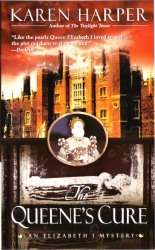 Readers familiar with the period will feel at home and even manage some sympathy for men like Cromwell and Henry VIII. 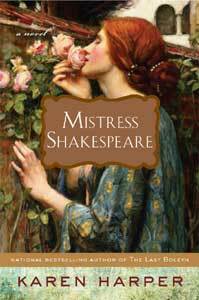 Still, bestseller Harper (Mistress Shakespeare) maintains her focus on the roles of women—both powerful and powerless—in Tudor England, resulting in another enjoyable proto-feminist historical romp." Not every ebook retailer offers customers a chance to pre-order a digital edition before it goes on sale. 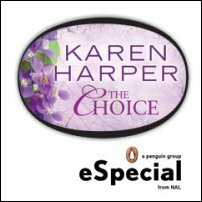 For the retailers that do I’ve provided links below for Karen Harper’s THE CHOICE. A note about the Apple link: it isn’t a buy link, just a webpage that shows the work is available for preorder. You have to own an apple device and download the ibooks app to make any purchases there. The author may still want to post it. I’m pleased to be able to share with you this historical novella set in Baltimore in the heady days of America’s growing trade with China, when that country posed many dangers to outsiders. Sound similar to the situation today? It always amazes me how historical stories can seem so current. Of course, what never goes out of style are life-changing choices such as what work to pursue and whom to marry. In that respect this story seems timeless as Violet McClellan and Nathan Stone struggle through their relationship and agonize over a possible future together. The Choice first appeared in the spring of 1995 as “Violets Are Blue” in an anthology entitled Blossoms, with stories by four other authors. Each one tied somehow to the beauty of flowers. Lilies play a key part in The Choice, and I named my heroine Violet for the color of her eyes. The hero is what we might call today an entrepreneur or foreign trader. I have always been fascinated by sailing ships, and the fastest vehicles on the planet at that time were the beautiful clipper ships which opened up the lucrative trade to the Orient—but at the cost of great danger and risk. Baltimore of the 1830s may seem a long way from Tudor England––which is the focus of my next full-length historical novel, The Queen’s Governess, coming in August 2011––but people are people in any time or place, with the same anxieties and needs and desires. The Queen’s Governess is the story of the woman who rose from obscurity to become the governess and substitute mother to Queen Elizabeth I, and it also teems with danger and life-changing decisions. As ever in my books, it includes a rousing love story and guarantees a happy ending. I hope you will find a great escape in my fiction and take something precious for your own life from these stories. click here for PDF or here for Word format.